As for my contribution, I am going to focus going through each step of the specific quests when going about getting your awesome and dangerous Daggers. 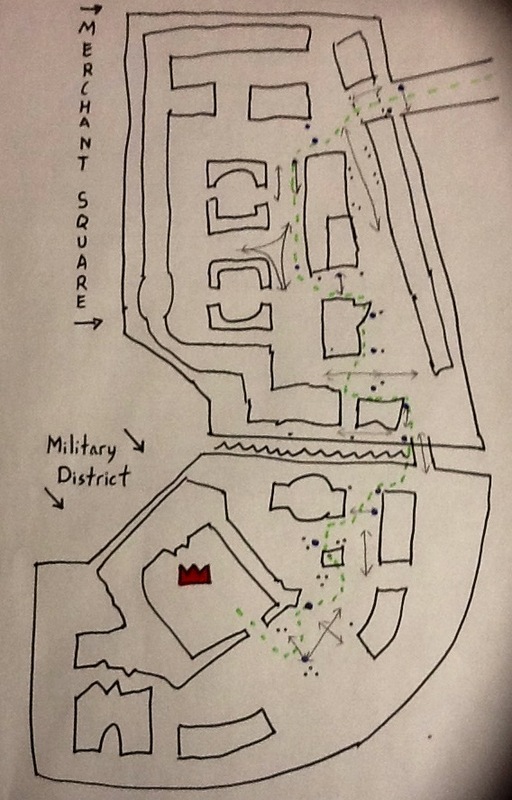 This first map will give you a rough estimate for sneaking through to Ravenholdt Manor. Just follow the green line to the coil of rope in the back and jump in the open window. Watch out for the standing guards (dots) and the patrols that follow the arrow paths. You can use Distract and Sap to slow and incapacitate the guards, and Sapped guards will not alarm when they are inside your circle. This second map is a bit more detailed and will get you to Creed for Assassin’s Creed, I mean Assassinate Creed. Same sort of Legend as before, the Crown in the Military District is Creed. A video of the sneak through to Creed can be found here, helpfully made back on the PTR by Method. Next part will go over the Gilneas portion of the quest and the initial gem cluster gathering. A big thank you to Beruthiel for including me in her Welcome Wagon Post today! Beruthiel has her own blog at Falling Leaves and Wings, which is one of the blogs I like to keep up with because of her insightful posts. Be sure to check it out if you have some time. If you are just starting the legendary quest, you will be very happy for your first pull of this boss. Just make sure to pickpocket her before the fight and don’t worry about the other rogues in your group, her pockets currently reset after 5 minutes or a wipe, which is plenty of time to get all your rogue brother’s a ring as well. Overall abilities and strategy are available for viewing *here*. The fight has three phases in essence. Phase one or the “Main Phase” consists of her standing in the middle and a basic spank and tank mechanic. I would suggest that rogues save their cooldowns until after a phase shift back into the Main Phase because she takes 100% increased damage for a short time. The other things a rogue needs to worry about in this phase are Ice Tombs, which work like Sindragosa’s in that they must be broken open to save your buddies, but they do not spread to nearby players. In most cases, your raid will have the ice tomb targets stack near the boss so they can be cleaved down quickly while still damaging the boss. In this case, Blade Flurry excels for combat rogues and FoK does wonders for Assassination (sorry sub, better stick with either focusing one at a time or stay on the boss and let your raid members do the breaking). The first of the two is her Ice Phase, in which she forms a bubble around herself and the middle area of the stage and sets two rotating Ice Crystal walls spanning the diameter of the stage in a clockwise manner. She will also be shooting Ice Crashes that will hit wherever there is a blue circle on the ground. To get her out of this phase, your raid must destroy the four Crystals spaced around the stage. The second of the two phases is the Lightning Phase. In this phase, there are 4 conductors in the same places as the crystals were and 1 lightning add. Your raid needs to kill the lightning add near one conductor to short it out, then form a chain to spread the lightning all the way to the other 3 conductors. There is also a periodic lightning damage spell going out constantly as AOE. Ice Phase: Sprint to get to a crystal asap when she goes into the phase and watch for where the Ice Walls are spawning. Be warned that the animation for the Ice wall is SMALLER than the actual area of affect so give it some extra room. Your main goal here is to get to a crystal right behind the leading Ice Wall and unload on it before having to move on. Not much specifically here for rogues besides using sprint when you fall behind, but please make sure not to tunnel vision and die. When there is only one crystal left, you should save Sprint or Shadowstep to use in order to get to the boss quickly, because she will be taking increased damage for a short time. Lightning Phase: Let your tank pick up the add and then dps it down hard as only a rogue can. You can use feint to lower your AOE damage taken and Cloak can be used to resist all damage for its duration in this phase. After the add is down, help with the lightning chain, but be ready to use Sprint or Shadowstep to get to the boss as soon as the last conductor is down to maximize your uptime on the boss while she is weakened. Hey there, and welcome to another installation of Rogue Reasoning. This week I am going to cover a couple of definitions that i feel many players seem to use incorrectly. This is probably the most common word used to describe a Rogue’s actions in PvP. Usually, people complain using this term when you come up and kill them while they are questing or just hanging around PvP flagged. I don’t know about my other rogue brothers, but in my opinion if I see a flagged Alliance or vice-versa, I will most likely attempt to kill it, regardless of grouped buddies or guards in the area. Let me tell you something, if you are at max level and you are killed by another max level, it is not Ganking, it’s PvP. If you get killed while you are at low health after a fight, or while fighting other mobs, or even if they have 2-4 buddies, that is still not Ganking, it is strategy. As I have posted before about this, fighting fair is a misconception. There are no fair fights to be had in the open world, so one must stack the deck in their favor. Ganking only applies when the killer is at least 3 levels higher than the deader at max level, or 5 levels higher while leveling (values are subjective, but those are my approximations). In this case, feel free to complain of being ganked. Ah, ninja, the role model for the rogue. In feudal Japan, ninja were trained in espionage, sabotage, infiltration, and assassination. They were the antithesis of the Samurai, who based combat on honor and respect. They did what had to be done in order to get the job done and win. Sorry, tangent there, what I want to cover is what a Ninja is in Warcraft. With the new patch out, I have heard many complaints start up again about so called ninjas in PuGs. Let me start out by saying that my definition of Ninja dates back to Vanilla. Back then, a ninja would try to take every item or piece of gear he could to vendor or auction. Blizzard has made great strides since those days to cut back on this sort of problem and I feel that they have succeeded. Let me put out my current definition of Ninja: One in a group who uses master loot in order to work around pre-stated or poorly worded loot rules. This might surprise you rogues, since we are not on the taking end of off spec rolls since we only damage (but do it darn good), but I don’t label this ninja. Sure, I might be frustrated, but it is not the action of a ninja and I will not call it such. The only times I worry about ninja looting is when I Pug raids in current content or old world transmog runs now. Since I only ever go in guild or lead them myself (in the majority of cases), I have not called anyone a ninja except in praise for awesome roguish moves for a long time now. In summary, please think twice before continuing the incorrect usage of these gaming terms as it dilutes the true nefariousness of these actions. Thank you for your time and please let me know your opinions as well in the comment section. This fight’s main challenge is posed to the raid leader and relies on his ability to make quick decisions on the fly for choosing slimes to kill. The overall abilities and strategies can be found *here*. As a rogue, we are notoriously bad for target switching, so this boss can cause some issues. Combat rogues have the advantage for switching to a slime and back due to the faster cooldown on their Redirect and having a faster return of sprint to move back and forth. You should pop your cooldowns fairly early in the fight before the slime’s spawn to get that extra dps in before having to switch targets. As soon as the slime’s spawn, pop sprint and get to it as fast as possible. I would suggest that you save redirect for when you return to the boss as opposed to on the slime *if* you are not combat specced, in which case you can probably use it both times. Red-stack right on top of boss and you should not have to worry about popping feint if this is the only AOE slime going out. Black- Lots of adds are going to spawn, Assassination shines here with FoK, but Blade Flurry does fairly well. Subtlety is pretty much out of luck here, but you should still be using FoK while there are still a good amount of adds alive. Green- most likely you will need to be spread to max melee range in order to be far enough away from other people to avoid damage being spread. A simple /range 4 will let you know if you are too close to anyone. Feint if you are stuck in range with anyone in order to lower your damage taken, but you should not have to. Yellow- if the healers are having issues, be sure to be popping Feint on CD for this slime to lower your damage. Hopefully you will get this one with black or red where you will be stacked in the mid for healer convenience, but it can be stuck with green occasionally. Blue- You need to jump on that mana void as quick as possible to get it fairly low on health. Redirect back to boss after it gets low and let the range and healers finish it off. If Blue and Red slimes both hit, you will either need to let only range hit it or keep Feint up as much as possible while staying as close to the boss as you are able. Purple – This slime should never be up, but in the off chance it does, I would listen to your healers “oh crap it’s going to pop” and hit feint when someone blows up to lower your damage taken. Other than the slimes, just stay behind the boss and burn him hard. Rinse, Repeat, take loot. If you ever played table tennis, aka Ping Pong, then you will have no trouble understanding the mechanics of this fight. The fight has fairly simple mechanics, all of which can be found in the Icy Veins guide *here* along with the overall strategy. The boss should start out turned towards the ranged so the ball is spawned between where the melee and ranged are usually, so be ready to position yourself at his back before the pull. You will have to rotate around after the spawn to get stacked with the other melee. Another big thing to remember is to save your main cooldowns for the Black phase of the boss because he will be taking increased damange. The main damage in the Ping Pong phase will be when the ball hits your group. You can Cloak of Shadows the damage and feint will also reduce the amount of the AOE taking. Once it is time for the ball to hit the boss, you have a couple of options. The first is to just rotate around to stack on the tank and damage the boss from the front, although this will lower your dps slightly. Secondly, you can just rotate to his side that is farthest from the likely contact point and continue hitting him to your heart’s content (which is the choice a good rogue should always make). After the Ping Pong Ball hits the boss, be ready to re-position yourself to wherever his back is when he moves to the center. This is the time to hit all your cooldowns and burn as much of his health as you can since he will be taking a substantial increase in damage proportional to the amount of times the ball was bounced. If your healers are having trouble keeping you up, popping Feint on its cooldown every time can help alleviate some stress by lowering your damage taken. Repeat steps as necessary in order to wipe the floor with him. I am planning to flesh out the main bits of the site this weekend to get it in a state to moved forward. This will include actually putting links on my helpful links page as well as setting up the site with better images and themes. 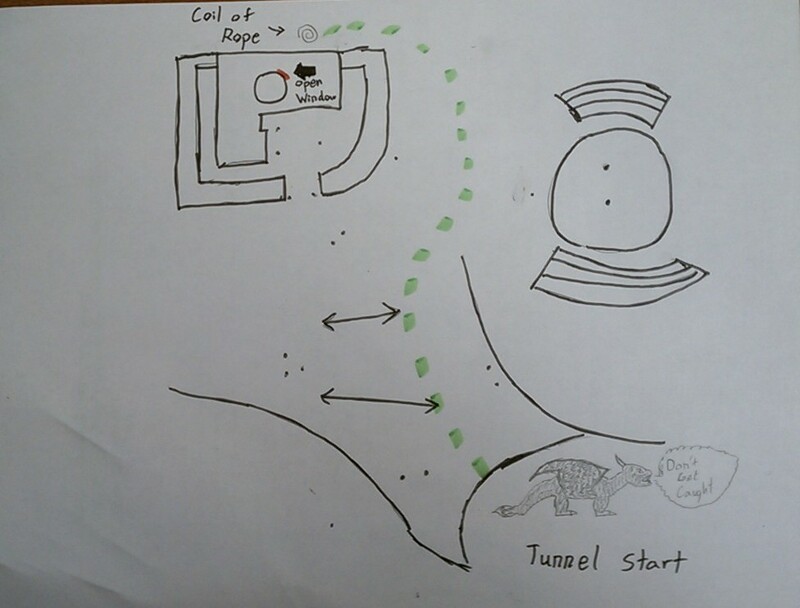 I have done another quick hand drawing for the Ravenholdt sneak quest, complete with Morstrasz hanging out in the cave that I will upload soon. Rogue reasoning is going to be my first attempt at a weekly feature, in which I will be giving my opinion on some rogue related issue from a rogue perspective. Throughout my time playing Warcraft for the past six years, I have seen many examples of players raging, cursing and complaining about many different things, and the root cause of the majority of these issues can be whittled down to their sense of entitlement. I am not saying I am innocent of this, far from it, but it is still the basis of problems within a MMO culture. Entitlement is a tricky little thing in that a Utopian society can sustain each individual’s desires. Unfortunately, World of Warcraft is far from Utopia. Much like the real world, there is a lack of resources to meet every single person’s needs, which creates a sense of competition. It is a simple fact that in this sort of environment, the survival of the fittest is the only rule in play. I am sure you can think of a time that you were on a quest to loot some object and as you fought off the NPC guarding the item, some other person walked up and looted it while you were busy and then walked away. How about back when there were outdoor bosses and your raid had them down to 10% and were suddenly attacked by a cross faction group who stole your kill? These are all examples of times when our anger stems from our sense of entitlement. Now in WoW, we band together into groups, raids and guilds in which we give up certain things (split xp, gold, etc.) in order to gain better rewards, which is how society works in the out of game world as well. Blizzards limits competition by allowing rewards to be instanced and meted out by points which are individually gained, but what about the items out in the world that are free to all who chance upon them? As a rogue, you are at a significant advantage when it comes to completing objectives out in the wilderness of Warcraft. Stealth in and of itself allows us to scout out situations, get the drop on our foes, and set up 0% failure scenarios. It’s a wonderful thing and one of the reasons I love being a rogue. This is also one of the reasons we are probably the most despised classes in the game. The sad truth that we must realize is that Blizzard designed a rogue with this play style in mind. Do what you must to win, if you cannot beat them head on, wait for them to be unprepared, wait for them to be weaker, wait for them to lose focus. Rogues must learn patience and timing in order to be effective, and there is no better teacher than trial and error. Sometimes we have to fight dirty to win, letting our opponent get low on health before attacking or waiting until he is in another fight to make our move. Morally, these actions can get dicey, but Rogues are not meant to stand toe to toe and win, we use our abilities to set up victories. Sadly, when we are in competition with someone, there must always be a loser. It is my opinion that the practice of rewarding failure is demeaning and makes an individual worse and not better. There needs to be a drive to push yourself to get better, to improve, and if you can get the same rewards doing 1/2 the work, why should anyone go 100%? Failure is the best teacher mainly due to the fact that you are less likely to forget your failings when they result in disappointing your sense of entitlement. In a game played by millions, with each person working to complete their own objectives, what are you truly entitled to? Answer: you are entitled to complete any action in game that is within your power, as long as you are able to outplay, outwit, or outmaneuver any other person competing towards the same or a opposite goal. Complaining about your failure does nothing. Instead, find out why you lost and work towards never letting it happen again. Apparently you can now queue with your Real ID friends for BG’s, which is a welcome change in my opinion. Now the question is whether cross-realm raiding with your friends will be possible in the future. What other features do you all hope to see come to the cross-realm grouping capability?